Every song is based on a basic chord structure upon which the melody relies for overall feeling and sound. Altered chords (variations of the original chords) make a song sound even more rich and professionally arranged. 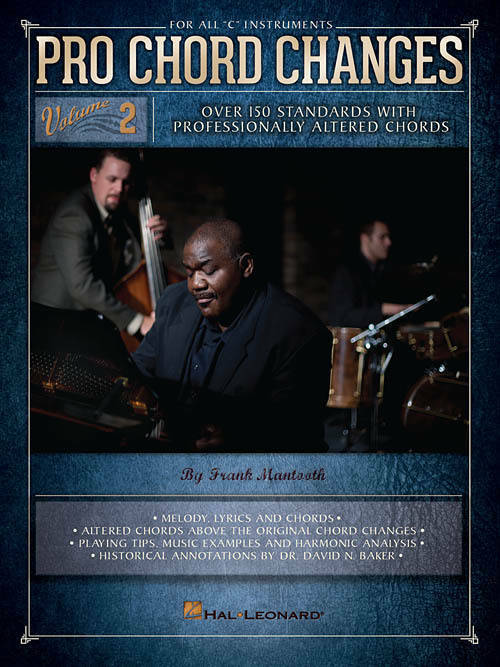 Frank Mantooth has written this series of books to give pianists the very best chord changes for some of the most beautiful songs ever written. Each song includes the melody line, chord symbols, and a second line of altered chords printed above the original chords. These valuable collections also include playing tips, music examples and harmonic analysis as well as historical annotations. Volume 2 features over 150 more songs, including: After You've Gone, Ain't She Sweet, Bewitched, Blue Skies, Body and Soul, A Day in the Life of a Fool (Manha De Carnaval), Easy Street, Fly Me to the Moon (In Other Words), God Bless' the Child, Gone with the Wind, Here's That Rainy Day, Is You Is, or Is You Ain't (Ma' Baby), It Don't Mean a Thing (If It Ain't Got That Swing), The Lady Is a Tramp, Like Someone in Love, Lover, Come Back to Me, Lush Life, Meditation (Meditacao), Misty, Mood Indigo, Moon River, A Night in Tunisia, Pennies from Heaven, Polka Dots and Moonbeams, Quiet Nights of Quiet Stars (Corcovado), Satin Doll, So in Love, Stella by Starlight, The Thrill Is Gone, Try to Remember, Waltz for Debby, When You Wish upon a Star, Who's Sorry Now, You Oughta Be in Pictures, You'd Be So Nice to Come Home To, Young at Heart, and more.